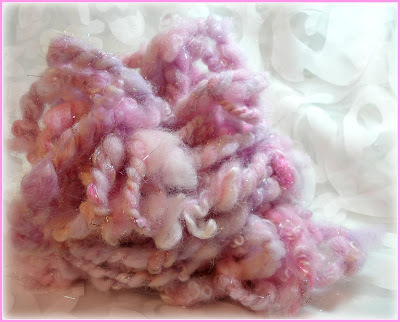 I was asked to spin a soft, fluffy, cloud like yarn from the PinkFog! Alpaca and Silk Spinning Clouds. I may have gone a bit over on the fluffy! I put the #2 pencil in for scale reference, as you can see even where the strand is small, it's mostly more than pencil thickness, and the bulk of the skein is, well, really bulky! It's a super bulky 1-3 wpi, but it's light as air and as soft as super soft alpaca and silk can be. I hope I captured the cloud like effect of this yarn, it's hard to photograph clouds...camera shy, hahaha. Do your hands get cold? Mine do, especially when I'm sleeping. I'll wake up and one hand will be absolutely freezing cold from being out from under the covers. So I knitted myself some cuffs, of course they had to have bobbles! They have been so nice, I like them much better than fingerless gloves, I can wear them around the house when I'm working and the fingerless part means I can push them up on my wrist and out of the way if I need to. I'm currently working on a second pair, I decided I wanted them a little longer so I can scoot them down over my fingers a bit more if I want and my wrists will still be covered. But, the most exciting fibery thing this week is, that yesterday I got my copy of Lexi Boeger's new spinning book, Hand Spun, New Spins on Traditional Techniques. It's completely wonderful!!! I was so excited, I dropped everything and sat down and started reading it...then I remembered I was on my way out the door to run some errands! She puts together a great book! I've gone through it over and over. I do that when I'm excited about something, what I will eventually do is make myself slow down and really absorb all the information. (To accomplish this, I will have to try not to let the wonderful photographs distract me!) Not only are there spinning techniques and patterns, but there are also interviews with some of the many fiber gurus that inspire us. It's so cool to get a closer look at them and their creativity and the paths that lead them along their fiber filled adventure. Buy the book spinner friends, you will not be disappointed! I was thinking about you today, your swap gift came overseas with me in my hand-luggage, so it got it's new home quite swiftly and is now hanging above my bed, so I look at it every time I walk into my room :-D.
I love what came out of your pink fog, still looks really dreamy! Your pink cloud yarn is fabulous. What will become of it now? Sleepy cuffs are a great thing for keeping your hands warm at night and day too. The bobbles are so cute. The book sounds like just what every spinners should have. Thanks! Ok, that mound o' pink clouds is amazing! And I love when people get excited about a book. I'll look forward to seeing how you interpret techniques from it. 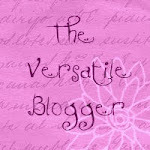 I absolutely love the pink cloud yarn, it is amazing and I am quite jealous of the recipient. Now I want to knit wristlets...they're lovely! Very unique. Adorable cuffs, I love the bobbles! That pink cloud............I want some, it looks divine! Your mitts are beautiful - I wear them all the time too - totally understand cold hands!!! 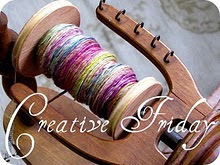 Your spinning is lovely and it does look so soft and cloud-like. Just beautiful! 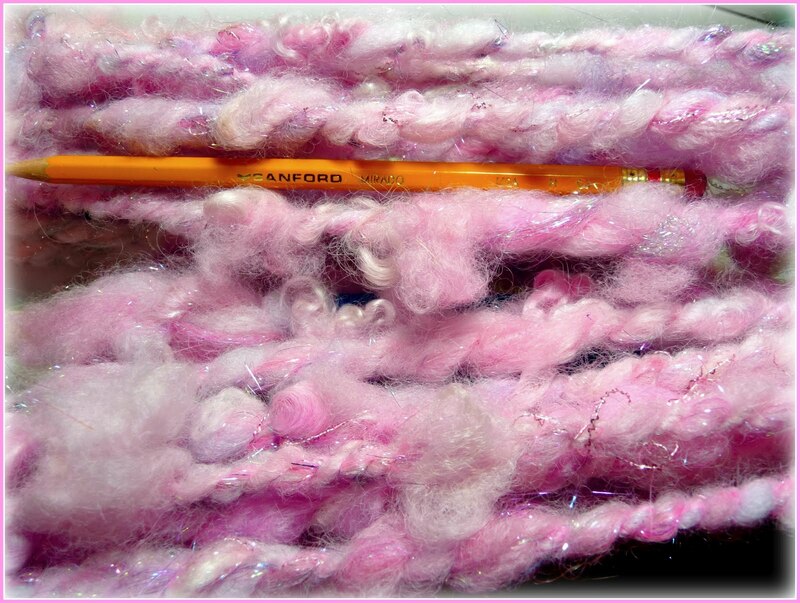 LOVE the pink cloud yarn!!!!! Also, I really need to get Lexi's book. Can't wait to read it!! Stinkin' shy clouds. I love it though. Very nice. So here's the question. 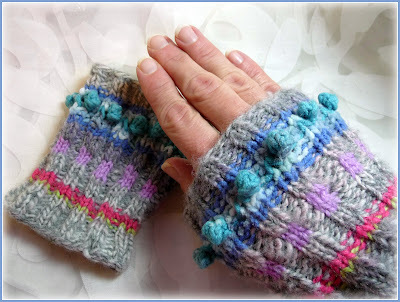 Mitts help your hands stay warm. I have a freezing fingers issue and find that mitts don't help that for me. They are really awesome though. I do love me some bobbles. Love the bobbles on your wrist warmers. I cannot wait to see what you spin up after reading your new book! I am sure it will be beautiful. That pink cloud is amazing. I love your idea on the wrist warmers. I'm going to have to make some for myself because I have the same problem of being cold all the time.